Wireless connectivity is one of today’s emerging technical innovations and is becoming a vital part of a home network. This feature allows you to seamlessly connect your wireless devices to the Internet without the hassle of plugging cables to your devices. The Linksys Smart Wi-Fi’s main objective is to provide the best experience to your home network. Wireless devices that are capable of connecting to a router such as smartphones, tablets, gaming consoles, cameras, and wireless printers will be able to utilize the Internet connection through your Linksys Smart Wi-Fi Router. QUICK TIP: To connect a device, refer to its user manual for information on how to connect it to a wireless network. Each device has its own way of connecting to the network, but the common method is to select the network to connect to and enter a security key or password. 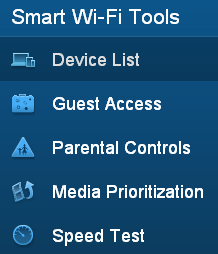 Click Device List under the Linksys Smart Wi-Fi Tools navigation menu. NOTE: If you have a Linksys WRT1900AC router, click on the Network Map Tool instead. Click on the Add a Device button. In the Select the type of device to add to your network page, select Other. 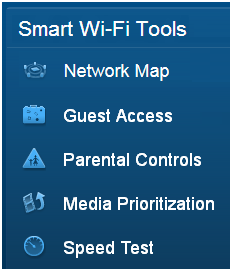 Take note of the Network Name (SSID), Password, and Security Type on the Add a wireless device page. Enter the Password or Security Key and the Security Type, if asked. NOTE: Some devices require the Security Type. When the device is connected, click in the Add a wireless device page. Your device should now be able to access the Internet. QUICK TIP: The device you've just connected should now be displayed on the Device List / Network Map. You can change the name and icon of this device in the Device List / Network Map of the Linksys cloud account. To learn more about connecting your wireless devices through the Device List Tool, click here. For Network Map Tool, click here. You can also maximize your wireless connection by changing the basic wireless settings of your router with your Linksys cloud account. For instructions on how to change your wireless settings, click here. Some Linksys Smart Wi-Fi Routers support only the more secure Wi-Fi Protected Access® (WPA™/WPA2™) as Security Type for your wireless network. If you're having trouble connecting a device or gaming system such as PlayStation® Portable (PSP), Nintendo DS™, TiVo®, wireless printer or other devices, it may be using an older security method called Wired Equivalent Privacy (WEP). To connect an older device that uses WEP security to your Linksys Smart Wi-Fi Router, refer to the device's documentation to see if you can change its wireless security setting from WEP to WPA™. If you can't change your device's security setting to WPA, you will not be able to connect the device to your router. For more information about connecting your wireless devices to your network, click here. NOTE: If you’re having issues adding a device to your network through your Linksys cloud account, make sure that you are connected to the correct Network name (SSID). Furthermore, if your device is connected to the correct network and connectivity issues persist, make sure to check if your router’s firmware version is up-to-date. For instructions on how to do this, click here.